Mosaic art dates back thousands of years, with classical works made of stones, glass, or ceramic tiles. Many modern digital artists work with individual pixels on a computer, but others still use physical objects to create mosaic art, piece by piece. What they use to make those mosaics is quite varied, limited only by the imagination and the availability of mass quantities of the chosen medium. Also, there may be something in the water in Michigan that inspires the use of unusual mosaic media. Here are some of the more unusual objects mosaic artists use. Jason Mecier is a mosaic artist who uses food and other small household objects to to create celebrity portraits. The medium he selects can be symbolic, such as the collage of hair care products that make up a portrait of Ru Paul, or a pun, such as the mosaic portrait of Condoleezza Rice made from rice. Mecier's series of portraits made with pills illustrates celebrities known for their drug use, most of whom are deceased. He also did portraits of the two 2012 presidential candidates made of beef jerky for sponsor Jack Links. 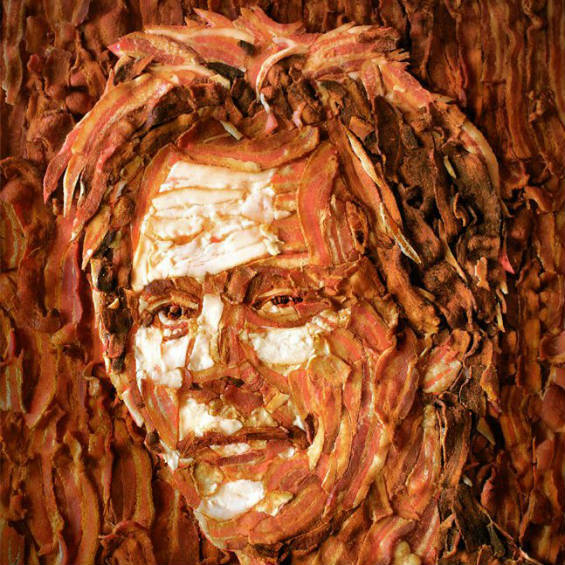 Mecier's latest viral sensation is a portrait of Kevin Bacon composed of 15 pounds of bacon! Russian artist and entomologist Vadim Zaritsky is a lifelong butterfly collector, but it saddened him to see the most beautiful part of the bugs, their wings, thrown away if they became damaged or disconnected from the body. 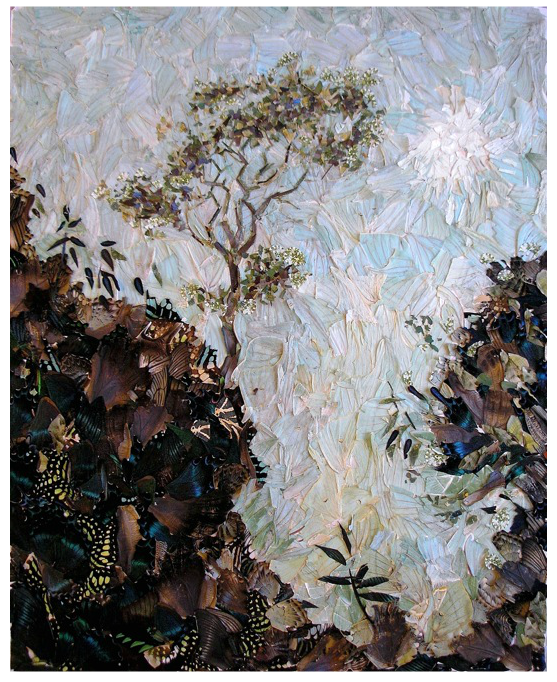 Even before Zaritsky retired from his career as a policeman, he began creating mosaics using butterfly wings! His works include landscapes, portraits, fantasy images, and even mosaic versions of classic works. Grand Rapids artist Scott Gundersen makes portraits out of corks. 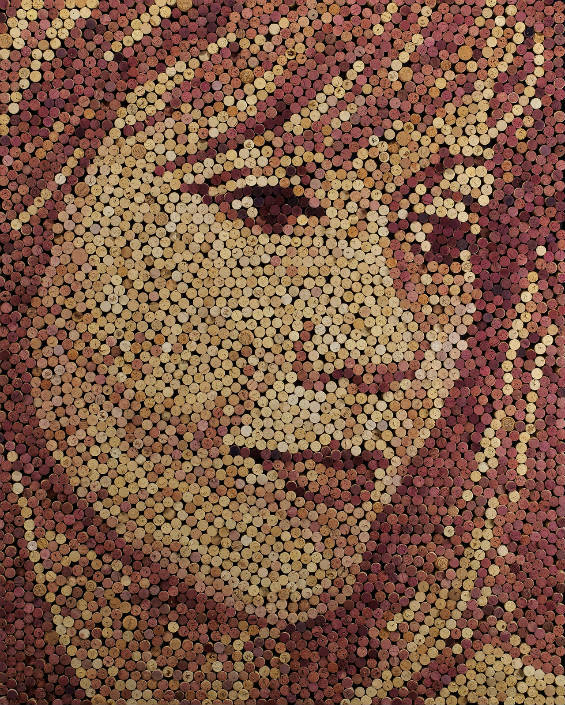 The portrait shown here titled "Trisha" is composed of 3,621 wine corks! You can see Gundersen in action assembling a previous portrait of almost 10,000 corks in a time-lapse video. He is constantly on the lookout for more corks to use. 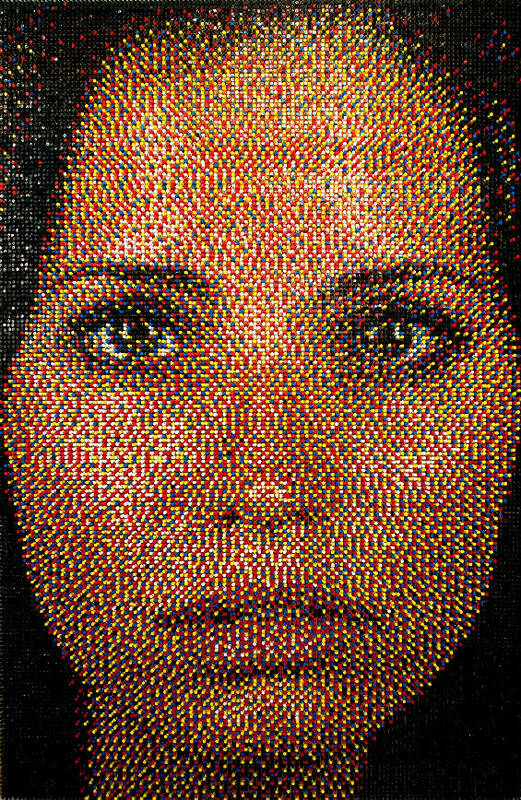 Michigan artist Eric Daigh uses pushpins in only five colors to recreate huge photorealistic (from a distance) portraits. The advantage of pushpins is that you know how to affix them; the disadvantage is that Daigh must sort each color from variety packages. One portrait may require up to 11,000 pushpins! 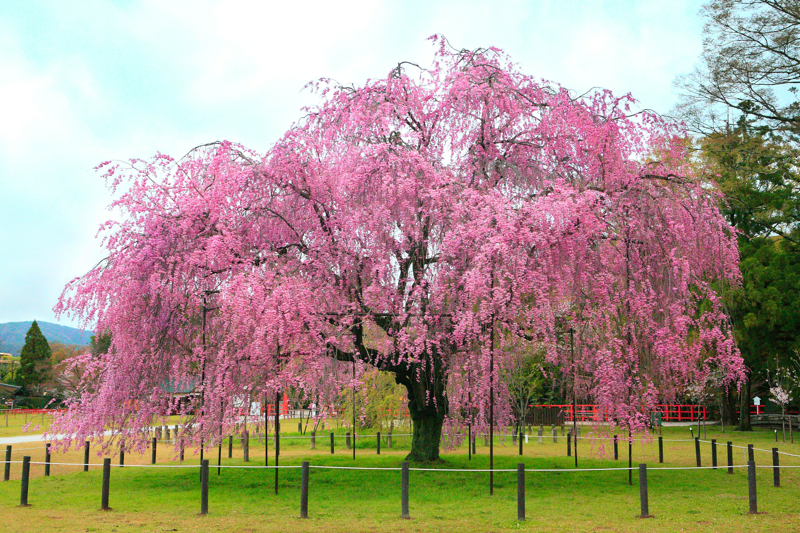 The London bakery Crumbs and Doilies was commissioned to assemble 10,000 cupcakes into a room-sized mosaic of a flowering cherry tree for the Japanese TV show ITTEQ. The cupcake mosaic recreated a photograph, and did it very well! See more pictures of the project at the bakery site. Albanian artist Saimir Strati makes huge mosaics out of varying items like nails, toothpicks, and corks. In fact, he is the Guinness World Record holder for the largest mosaics ever. 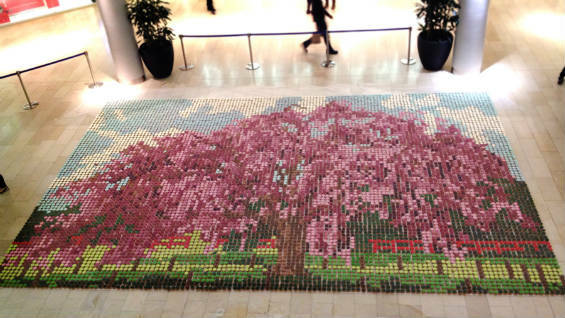 The work titled "One World, One Family, One Coffee" required over 300 pounds of coffee beans, estimated to be about a million beans, to make a 269-square-foot mosaic. 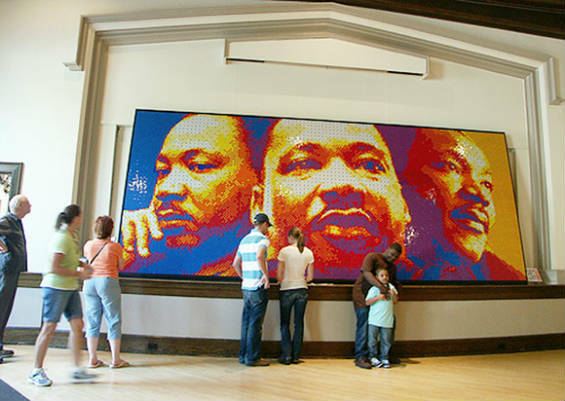 Designer Pete Fecteau (formerly of Michigan) created a mosaic of Martin Luther King, Jr. called "Dream Big" out of 4,242 Rubik's cubes. Each cube face has a grid of nine color stickers, and each cube had to be "solved" so as to present the right combination of pixels to render the proper gradient. The Rubik's cubes were rented, and returned when the mosaic was disassembled. Photograph by Tori Jo. Chicago artist Mary Ellen Crocteau works in many media. 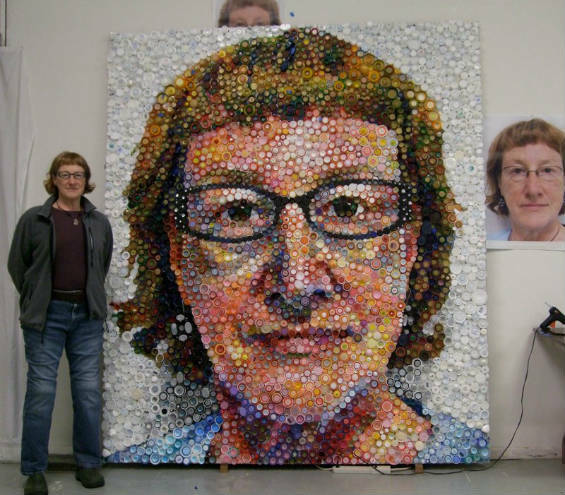 Her eight-foot self-portrait is a mosaic of bottle caps. Crocteau also posted some of the technical details of her bottle cap mosaics in case you'd like to make your own. 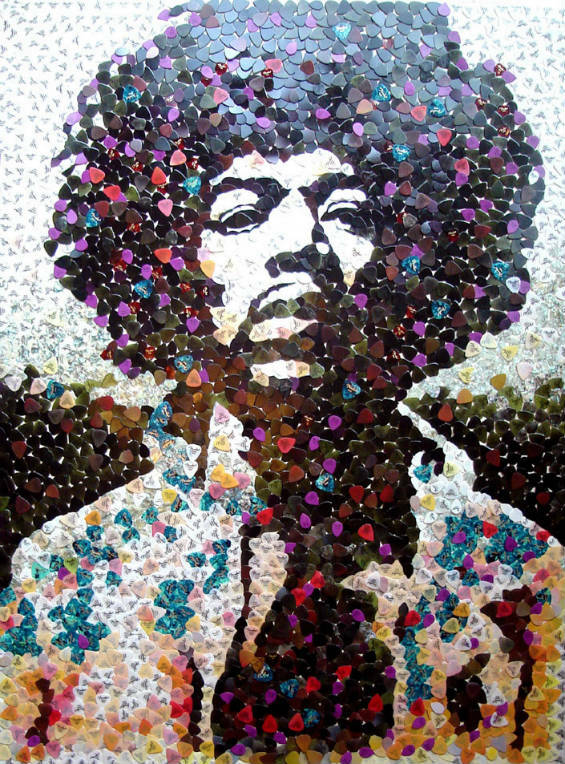 Manchester mosaic artist Ed Chapman works with various materials for his mosaics, and thought guitar picks were the appropriate medium for a portrait of guitarist Jimi Hendrix. 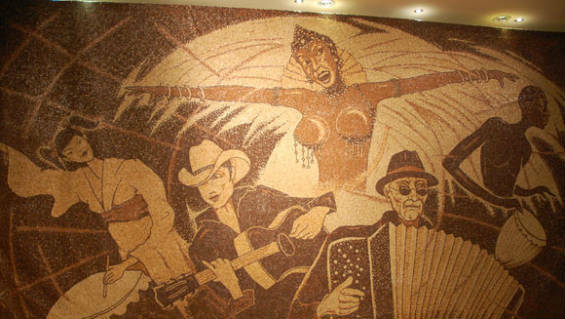 The music mosaic was sold for £23,000 at a charity auction that benefited a cancer research center. Candy sprinkles are tiny, and as pixels of a large mosaic, they can render unbelievable resolution. Canadian art student Joel Brochu made a four-foot-wide mosaic of a Beagle having a bath using candy sprinkles. He's getting sprinkled - get it? This project required 221,184 sprinkles, each of which Brochu placed by hand. Okay, now consider that the sprinkles he used only came in six colors and had to be placed just so to render the exact shades of the photograph he recreated. Impressive accomplishment, indeed!